I’m pleased to report that I’ve been promoted from Postdoctoral Fellow to Research Associate, at the University of Texas Institute for Geophysics in Austin, Texas. I’ll be continuing my research into glaciological processes and glacier change through the use of seismology, terrestrial radar interferometry, satellite and airborne imagery, and other geophysical tools. More papers and proposals, the currency of our trade, are on their way. I look forward to continuing and initiating collaborations, with students and fellow PIs, in the years to come. A new study, published August 10 in Geophysical Research Letters, demonstrates how seismic tremor can be used to track variations in the flow of water emerging from the termini of marine-terminating glaciers. This tremor, sometimes referred to as “seismic noise,” is recorded on seismometers, common earthquake monitoring instruments. Measurements of subglacial discharge variation at tidewater glaciers, which thus far have not been achieved, are a critical step towards understanding the present and future behavior of some of the largest and most rapidly-changing glaciers on earth–those that end in the ocean. Not only does subglacial water control fast glacier flow, but subglacial water discharged into fjords promotes glacier melt below sea level and can erode and redeposit glacier-stabilizing sediment at glacier fronts. These newly-reported observations of glaciohydraulic tremor open a broad new avenue through which to study these important phenomena. The study was authored by Tim Bartholomaus, Jason Amundson, Jake Walter, Shad O’Neel, Mike West and Chris Larsen. This study has been reported on the radio by the Austin, TX, NPR affiliate, and by EOS, the American Geophysical Union’s news publication. Additional coverage includes the Aug. 31 issue of the magazine Engineering News Record, as well as several websites, including, grist.org, futurity.org, phys.org, and Environmental Monitor. You can read the UT press release about our study here. Subglacial discharge upwells at the terminus of Yahtse Glacier. Now, increases and decreases in the amount of subglacial discharge can be detected through the subtle ground vibrations produced by the flowing water. Over the last month, I’ve had the pleasure of submitting three, new, first-author papers for peer review with a diverse set of co-authors. These papers are a combination of wrapping up old projects (including the last of my Ph.D.-related work) from Alaska, and also the first of new work coming out of Greenland. These manuscripts include unprecedented observations of tidewater glacier subglacial discharge through analysis of seismic tremor, characterization of the tremendous importance of subglacial discharge on the dynamics of adjacent tidewater glaciers and fjords in Greenland, and high-fidelity seismic monitoring of tidal and seasonal variations in iceberg calving. This is an exciting time, and I count myself lucky to be working with an excellent group of scientists. My teams and I are hoping for a few new C.V. line items later this year! Bartholomaus, T. C., J. M. Amundson, J. I. Walter, S. O’Neel, M. E. West, and C. F. Larsen, Subglacial discharge at tidewater glaciers revealed by seismic tremor, Under review at Geophysical Research Letters. Bartholomaus, T. C., C. F. Larsen, M. E. West, S. O’Neel, E. C. Pettit, and M. Truffer, Tidal and seasonal variations in calving flux observed with passive seismology, Under review at Journal of Geophysical Research. Bartholomaus, T.C., L. A. Stearns, D. A. Sutherland, E. L. Shroyer, J. D. Nash, R. Walker, G. Catania, D. Felikson, D. Carroll, M. J. Fried, B. Noël, M. van den Broeke, Contrasts in the response of adjacent fjords and glaciers to surface melt in western Greenland, Under review at Annals of Glaciology. Tim will be attending the 2015 Earthscope National Meeting in Stowe, VT, to deliver a plenary talk on the use of seismology and GPS to learn about glacier dynamics. This talk, on June 15th, will cover some of the projects Tim has been involved with in Alaska to understand subglacial hydrology, fast glacier flow, and iceberg calving, as well as future opportunities in Alaska and Greenland. The meeting, from June 15-17, will broadly be discussing Earth’s deformation in North America and beyond, and the future of the Earthscope project. Time series of calving icequakes can be used to track variations in iceberg calving rate, for example, how calving responds to rising and falling diurnal ocean tides. The extended abstract for my presentation is below. Worldwide, glaciers and ice sheets are losing mass and increasing global sea level (Shepherd and others, 2012; Gardner and others, 2013). However, the processes controlling these changes are not well understood. Changes in glacier hydrology and iceberg calving can both increase rates of glacier flow, thereby hastening delivering of ice to the ocean and low elevation regions. The understanding of these two processes is not yet sufficient to reliably include them in ice flow models for the prediction of sea level rise. The application of seismology and GPS techniques within glaciology allows insight into glacier hydrology and iceberg calving processes. At Yahtse Glacier, a tidewater glacier in Alaska, we seismically quantified calving at unprecedented tidal to seasonal timescales. Tracking of calving-generated icequakes reveals that calving of large icebergs is significantly more likely to occur during falling and low tides than during rising and high tides. We also observe that calving fluxes are greater during the late summer and fall than during winter, suggesting that, on the coast of Alaska, submarine melt of glacier termini is likely a dominant control on the calving rate (Bartholomaus and others, 2013). Background seismic noise (i.e., tremor) also offers glaciological insight. Tremor amplitude rises and falls seasonally and after storms, synchronously with subglacial discharge. Thus, subglacial discharge variations can be quantified at tidewater locations where discharge has been previously unknown. At Yahtse Glacier and Kennicott Glacier, also in Alaska, we use GPS to observe contrasting responses in glacier motion to melt, rain, and lake-drainage events (Bartholomaus and others, 2008). At Kennicott, speedup responses are short-lived and glacier motion quickly returns to background levels. Yahtse Glacier’s response to hydrologic events is long-lived and leads to progressively slower flow over the course of the summer, demonstrating that in some cases changes in subglacial water routing are not reversible on daily to weekly timescales. Together, seismic and GPS data offer views of glacier responses to environmental change with temporal resolution that is not available through approximately weekly satellite images. These highly resolved observations allow physical insight that improves our understanding of glacier physics, eventually allowing for better inclusion of glacier dynamical processes in ice flow models. Going forward, Earthscope’s Transportable Array in Alaska expands on the present opportunity to remotely track iceberg calving across coastal Alaska.­ New terrestrial radar interferometers offer a more complete view of ice flow variability by combining the spatial resolution of satellite imagery with the temporal resolution of GPS. All articles published through Frontiers in Cryospheric Science will be open-access (gold) and peer-reviewed quickly and independently by reviewers. Prior to publication, authors and reviewers work interactively to ensure that the submitted article is as flawless as possible. For their efforts, reviewers are recognized in the published article. A unique user interface facilitates this rapid and straightforward review process. Tim Bartholomaus has joined Frontiers in Cryospheric Science as an Associate Editor. I encourage you to learn more about Frontiers in Cryospheric Science, the Frontiers publishing community, and the Frontiers review system. Please don’t hesitate to get in touch if you have any questions. In work from several years ago, co-authors and I developed a model of subglacial and englacial water storage that reproduces some of the characteristic patterns of glacier flow observed in the field. This work, published in the Journal of Glaciology, was motivated by observations from Kennicott Glacier in Alaska, where a large, ice-dammed lake drains beneath the glacier annually. 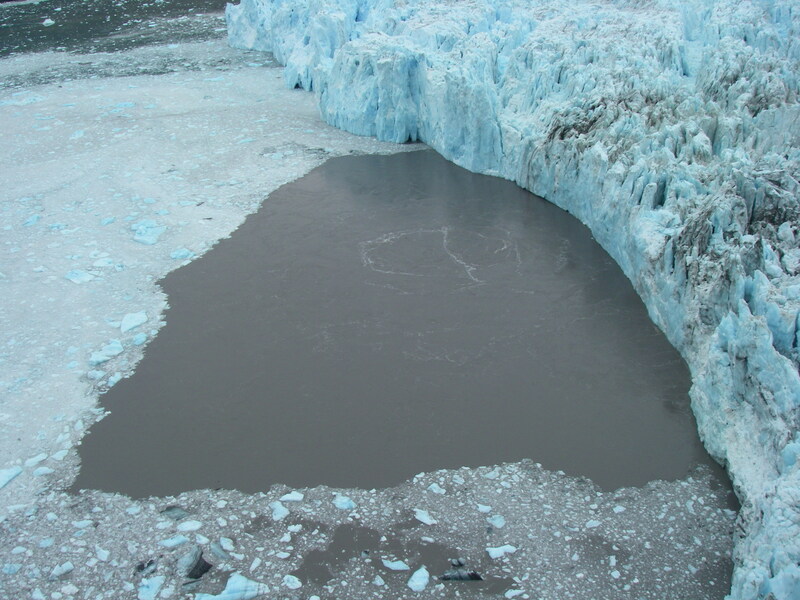 During the flood, water delivery to the glacier temporarily overwhelms the glacier’s ability to convey that water through and beneath the glacier, and the glacier flow speed increases by a factor of 5. Now, in recent work by Ed Bueler, head of the PISM ice sheet modeling group at UAF, the model described in Bartholomaus et al. (2011) has been extended in a manner that allows it to be implemented efficiently at a large scale. This distributed version of the hydrology model can now be used within PISM and other ice sheet models to simulate water flow at the base of, for example, the Greenland and Antarctic ice sheets. 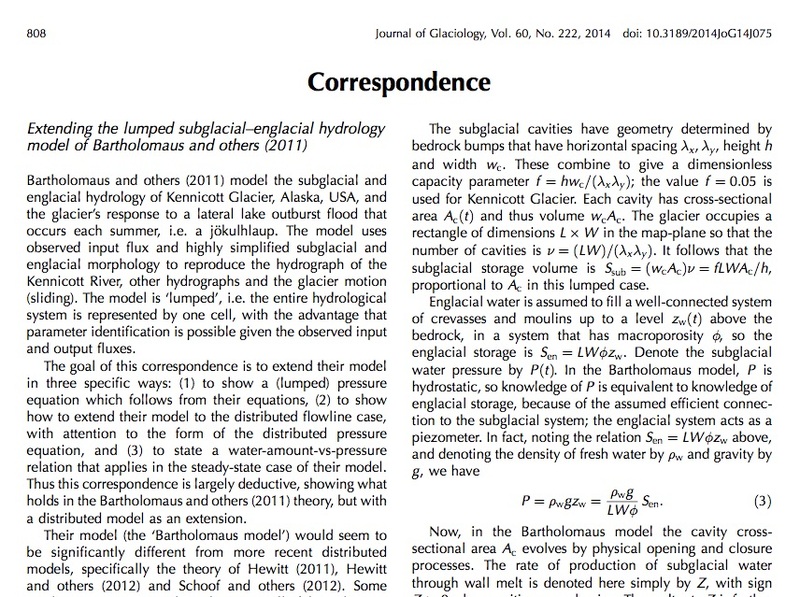 You can read more about Ed’s advance, published in the Journal of Glaciology, here. The talks will be on Thursday at 4pm in MW 3007 (C44B). Posters are on Tuesday afternoon in MW (C23A). The posters for two other similar sessions are at the same time, so I’m expecting that we’ll have a lively, well-attended poster session. This is also the first year for which I have scheduled the glaciology program on behalf of the AGU Cryosphere focus group. The planning for this meeting took place over the spring, summer and fall of this last year. I’m wishing everyone a great meeting, and that conflicts in the schedules of glaciologist conference attendees are kept to a minimum! During the last several days, I have taken part in an international workshop to identify the major gaps in the scientific community’s understanding of interactions between the Greenland Ice Sheet and its surrounding ocean. 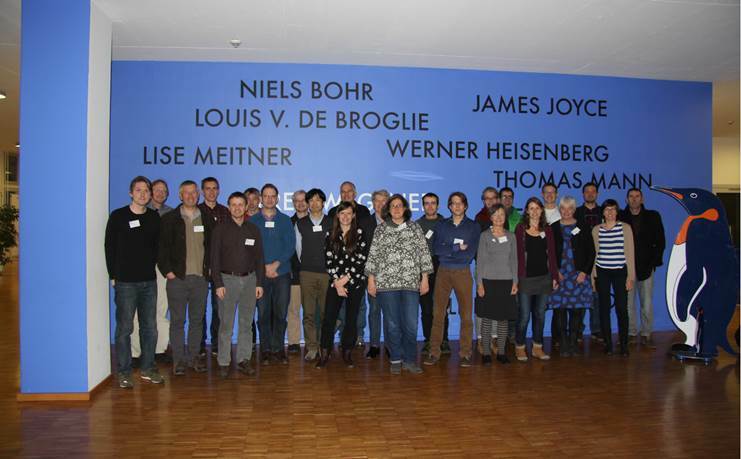 The workshop on Greenland Ice Sheet-Ocean Interactions, under the acronym GROCE, was hosted by the Alfred Wegener Institute, in Bremerhaven, Germany. Over the two day meeting, ~28 scientists from Germany, Norway, the UK, Poland, Japan, Canada, the US and other countries framed the questions we considered most essential for understanding Greenland’s rapid changes, as well as the strategies and resources necessary to respond to those questions. It was interesting and exciting to hear the commonalities and differences in research priorities from the broad cross section of glaciologists and oceanographers in attendance. The report produced to summarize our workshop will be used to help guide funding agencies and the proposal efforts of the broader scientific community. Next stop for me: San Francisco. The annual meeting of the American Geophysical Union starts there on Monday.